This May we called upon our FLIK friends, followers, and guests to submit their favorite recipe from Mom via an Instagram post for a chance to win a gift card to their favorite restaurant. The #Moms4FLIK campaign was a success and we're so excited to share more about our winner, including her award-winning recipe. FLIK: Congratulations! So, tell us a little about yourself. Tiffany: I am a 41 year old mother of 2 and enjoy family time, healthy cooking, exercising, and vacationing in Hawaii. I work for a financial institution in Phoenix, Arizona. F: Tell us a little bit about the dish you submitted. 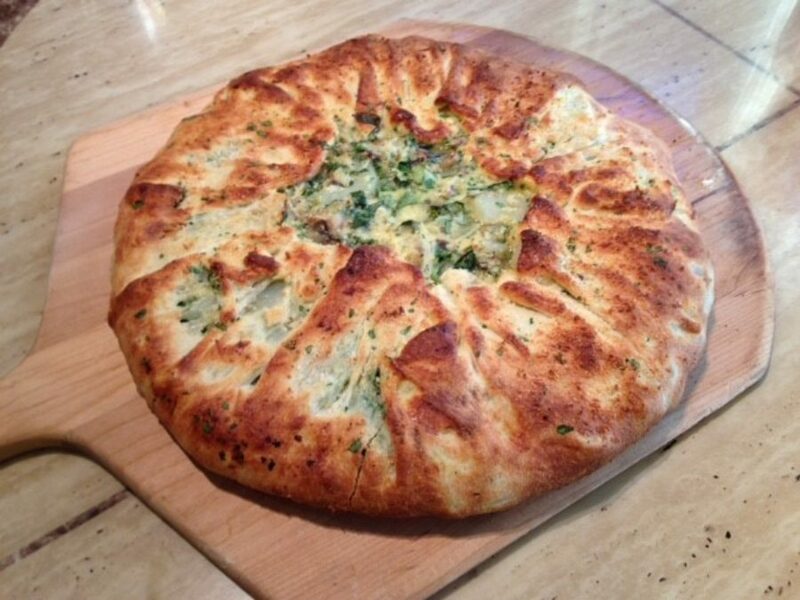 Tiffany: This potato pizza recipe is from my mother’s father’s Italian heritage. His mother, Maria, from Eastern Italy brought the recipe with her to the US in the 1800s and would sell pizzas, breads, and cookies in her small town of Niles, Ohio. FLIK: Why is this dish reminiscent of your mom/Mother’s Day? Tiffany: My grandmother and mother made this dish often and I haven’t seen it made or sold in any other pizza restaurants. When I think of my favorite recipes, they all come from my mother. Some of her family recipes include: potato pizza, stuffed cabbage, and Italian Pizzelles. FLIK: Describe your Mom’s cooking to us in a few sentences. Tiffany: My mother, Joanne, is a retired nurse anesthetist and her hobby has always been cooking and sewing. Since retirement, she has transitioned to a vegan and loves gourmet vegan cooking and making donation quilts for AIDS babies and kids with cancer. Preheat the oven to 450-500 degrees, then lower the oven temperature to 425 degrees when you're ready to cook it. Pro-tip: Put a pizza stone in your oven, then the pizza pan on top of that. I use my mom's round pans which are well seasoned. Meanwhile, boil the potatoes until they are ¾ cooked-then drain them. Reserve 1 cup of the water. Sauté onions for about 6 minutes until they are tender but still translucent, then add garlic and cook for about 1 minute. Cool. Roll out pizza dough until it is about 2-3 inches larger than the round pizza pan. Oil and sprinkle pizza pan with small handful of cornmeal which helps prevent pizza from sticking. You can also use parchment paper under the dough. Using a rolling pin. Roll the dough onto the rolling pin and then transfer the dough onto the pizza pan, centering it on the pan. You may need to stretch the dough from the center out if needed if the dough doesn’t extend about 2 inches all around. 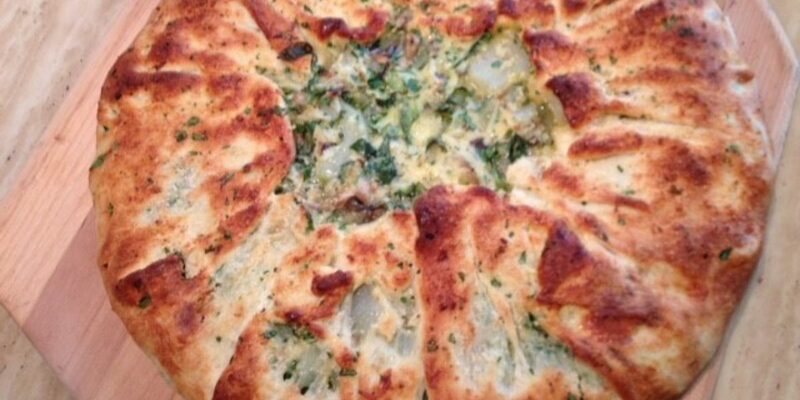 Layer about ½ the potatoes on the dough, sprinkle some of the Italian seasoning over the potatoes, add a thin layer of grated cheese, spread ½ the onion/garlic mixture over the potatoes/cheese/mushrooms and sprinkle ½ the parsley over. Make certain the potatoes go to the edge of the rim of the pan or else the edge of the pizza dough will be too thick. Repeat the above. After all the potatoes, cheese, onion/garlic and parsley are on: Crack eggs and mix with a fork. Add about ½ c potato water to the beaten/stirred eggs. Slowly pour this over the potatoes. I usually drizzle this in a circular motion and watch that it does not run over the edge. Take the edge of the dough that extends beyond the pan and bring it towards the center of the pan. Work your way around the pan. If the dough has a hole, patch it. I stretch the dough as needed. If there is too much dough you can cut part of it off. Brush the top of the dough with a little olive oil and sprinkle a little salt and a little more Italian seasoning and if you wish add a small amount of grated cheese. Bake in preheated 500 degree oven. After putting pizza in oven, decrease the oven temp to 350-425. Bake for about 20 minutes +/-. I often put the pizza pan on a preheated pizza stone. You can, if you wish, slide the pizza onto the stone using a pizza paddle and the parchment paper. After about 20 minutes, check to make certain the bottom of the pizza is brown/baked. Remove from the oven and cool on wire rack. If the bottom is not cooked all the way, you can put it back in the oven for another 5-10 minutes. You can also just heat the cut pizza slices in a frying pan if desired. Sprinkle with more salt and cheese, if desired. Coat rimmed baking sheet with 2 tablespoons of olive oil. Combine ¾ cup water and remaining 1 tablespoon oil in 1-cup liquid measuring cup. Using stand mixer fitted with dough hook, mix 1 ½ cups flour, 2 ¼ tsp yeast, 1 tsp sugar, and ¾ tsp salt on low speed until combined. With mixer running, slowly add the water mixture and mix until dough comes together, about 1 minute. Increase speed to medium-low and mix until dough is smooth and comes away from sides of bowl, about 10 minutes. The Q&A and recipe have been edited for context and clarity. For more information about FLIK Hospitality Group, please reach out to us at flikblog@compass-usa.com.